Her name is Violet — and she loves her new raccoon squeaky toy. 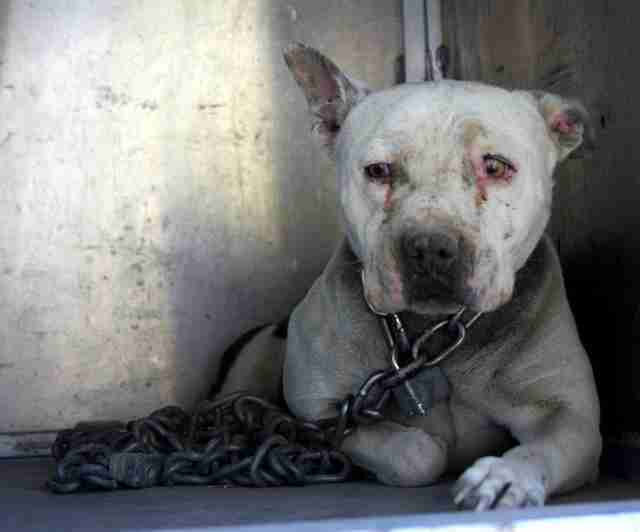 You could tell the dog had been chained for a long time by looking at her neck. The fur around it was stained black from where the chain had rubbed against it. It wasn't a lightweight chain either - it was made of heavy, thick-linked metal and was tethered to the dog's neck with a large padlock. 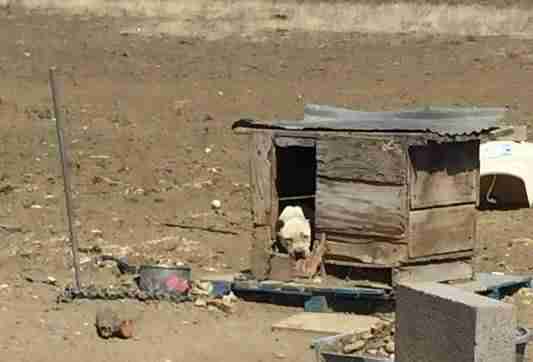 A woman driving by spotted the dog, who'd be named Violet, as well as five other chained dogs on the same property, according to Angela Stell, founder and director of NMDOG, an organization that rescues chained dogs. Violet was about 2 years old when she was found in December 2016, and it was possible she'd been on the chain her entire life. The property was in Miguel County, New Mexico, where it's illegal to keep dogs chained without owners being present. 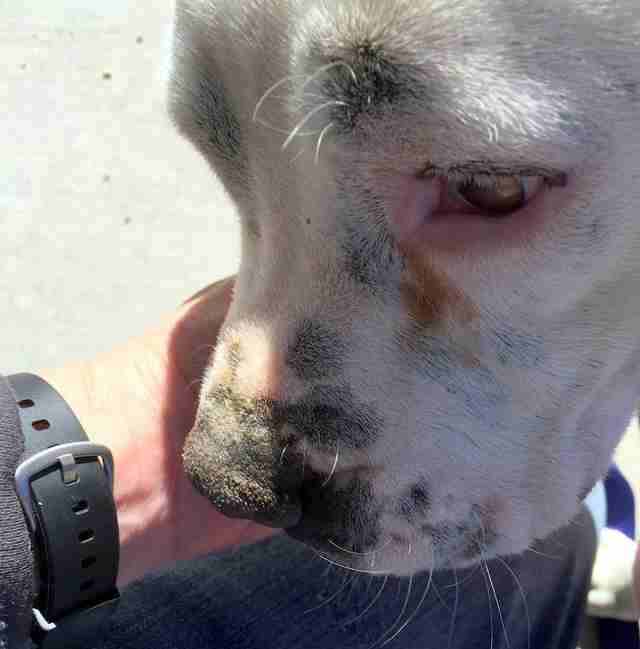 The woman got in touch with Animal Welfare Coalition of Northeastern New Mexico, and the county sheriff department eventually took the dogs into custody. "They were able to get somebody to go out onto the property and explain the ordinances and what was wrong with the situation," Angela told The Dodo. "When they did that, they found that the guardian of the dogs was in jail on unrelated charges, and he was not on the property able to provide daily care that these dogs needed." "I'm not sure if somebody else was staying on the property or coming to the property, but overall, these dogs were just kind of abandoned and forgotten," Stell added. 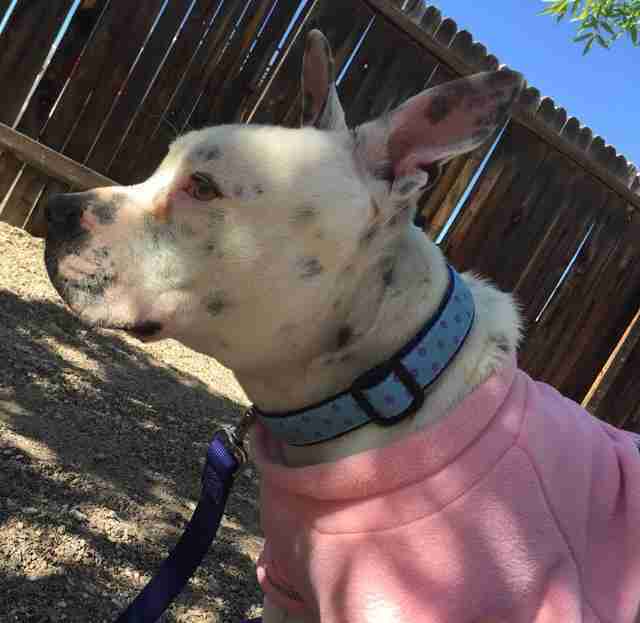 Rescuers with NMDOG started caring for several of the dogs, including Violet. The first thing they did was take the dogs to the vet, where they're currently staying in medical boarding. 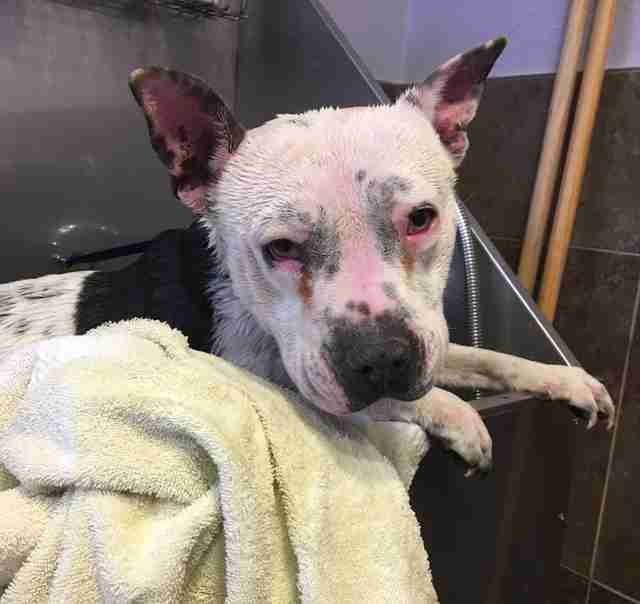 Violet's skin was sunburned when she was found, and she had a bad case of flystrike, a condition in which maggots eat away at an animal's flesh. Despite everything she's been through, today Violet is relatively healthy, according to Stell, although she still has a lot of fear issues to work through. "She was very, very afraid, and is still a little timid," Stell said. "If you raise your hand to do something, or move your hand too fast, she kind of ducks and cowers, like you're going to hit her. I can't imagine what somebody did to make her do that. But she is coming around with nice words and good, positive interactions." And every day, Violet is slowly learning to trust people, and is becoming more comfortable in her new environment. "She's very sweet, and she's opening up to us and the staff at the clinic," Stell said. "She really likes her stuffed animals, and she likes to curl up in her blanket. She likes to go for walks. She's just learning about the world around her, and not being chained anymore." Stell believes Violet never got to have a puppyhood. But now, she finally can. She even got her very first toy - a squeaky raccoon. 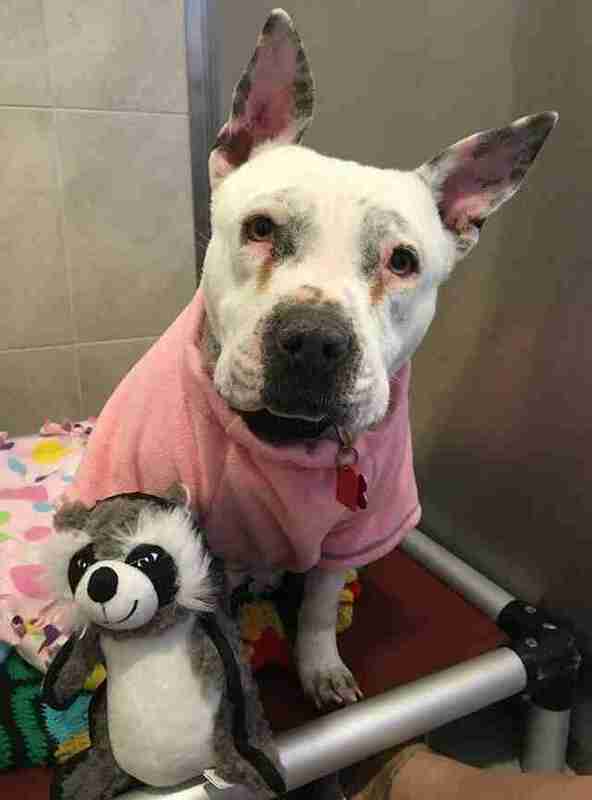 "I've caught her a couple times playing with her squeaky raccoon toy," Stell said. "She'll bat it a bit, and then look around to see if anybody is watching her. So she'll be very playful and carefree, and will be able to put this all behind her." 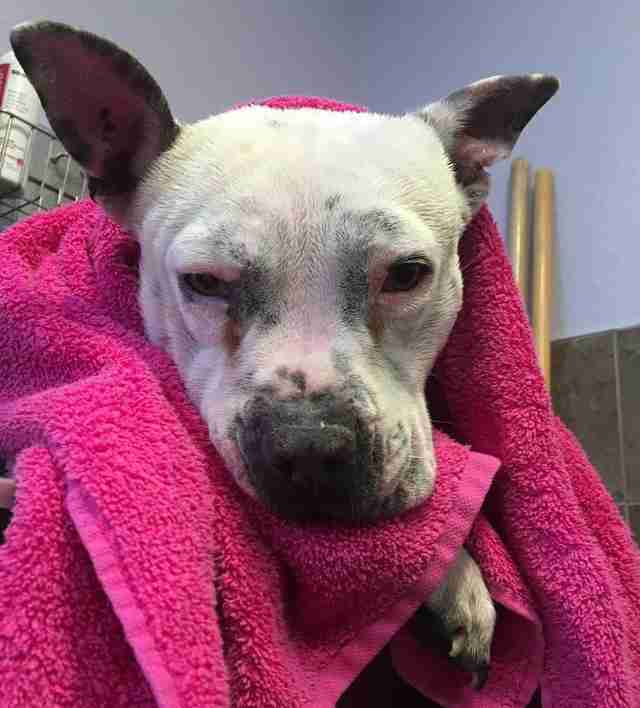 Violet still has more healing to do, and she also needs to be spayed, Stell said. But after a few weeks, Violet will be up for adoption. 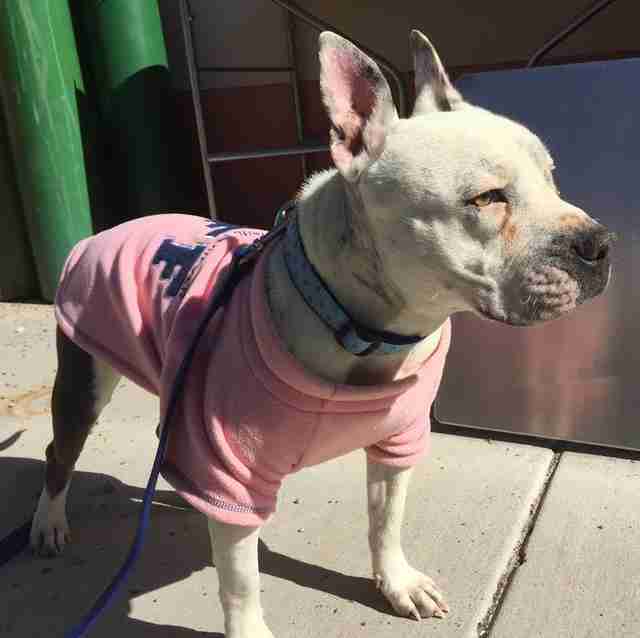 "She needs a home that will treat her as a member of the family, and keep her inside with them the majority of the time, because she's really going to be prone to sunburn," Stell said. "She needs a little princess home." If you think you have the perfect home for Violet, contact the NMDOG team. You can also help NMDOG rescue more animals by making a donation.